Happy Anniversary Totally Target… Let’s Celebrate! Can you believe it is the one year Anniversary of Totally Target? I can’t think of a better way to celebrate and to say thank you so much to all my readers than to do a fabulous giveaway! So, for this giveaway, four readers will win a $25 Target gift card. 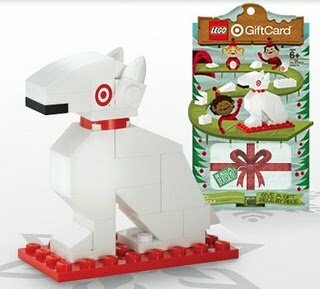 To make it more special, these aren’t just the regular gift cards but the super awesome LEGO gift cards, with $25 loaded on each for the winners. 🙂 I will only be running this giveaway for a little over 24 hours- as I want to make sure the winners get them before Christmas! To enter this giveaway, all you need to do is leave a comment on this post. Facebook and email entries will not count, so be sure to leave a comment on this post. If you want to earn an extra entry- you can “Like Me” on Facebook or let me know in your second entry comment that you already do. I will pick 4 winners using Random.org when it ends. This giveaway will end tomorrow night, December 9th at 11:59pm EST. Good Luck Everyone & Thank you so much – it has been a blast and I look forward to spending another year with you all! Would really love to win this!!!! I like you on FB also. I love your site, it saves me so much money! Thanks for all you do! Everyone loves the bargins and I also pass on coupons that I may not use myself, because i have extras. Last week, I passed on disney DVD coupons and told my favorite cashier at target how to stack and get that special gift!!! Thank you so much for showing me how to save, but also in a fun way. Even my kids check out the website before heading over! I am a fan for life…not to mention also on FB!! !